You hear about urban foxes living in London and sometimes you see shocking news stories about fearless fox attacks like the one last June that went after twin girls who were sleeping in their beds. You may have seen video footage as I have like the one shown here, but despite all that it can be hard to imagine them roaming the London streets. That changed for me last month when John and I spotted one after leaving my sister Margaret at her London hotel for the evening. 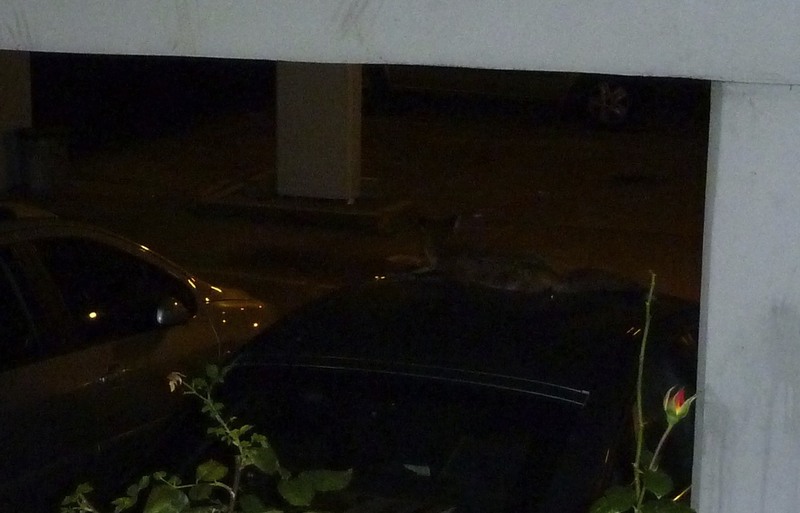 We had just dropped her off after my day-long birthday celebration and were walking past a small hotel with cars parked in a partially open garage when I spotted the bold one you see on the roof of a car. 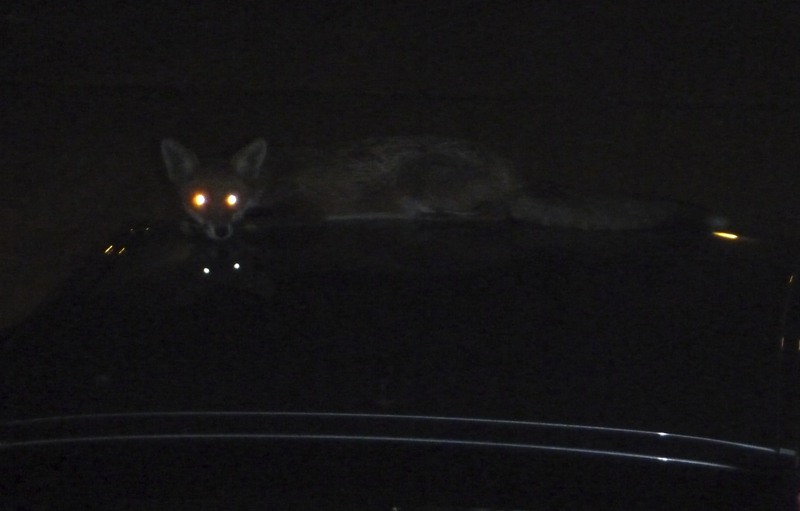 I took about 20 photographs while using the flash with little to no response from the fox. We were standing on the sidewalk about 20 feet away and I was more nervous than the fox seemed to be. In this shot you can see the fox just before he or she decides to move along. 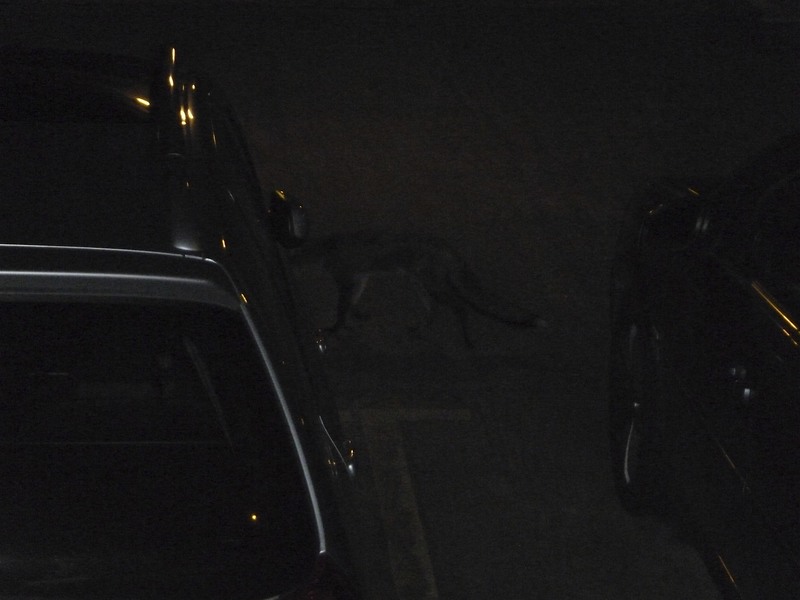 After standing up and having a slow stretch, the fox walks down the front of the car and goes off through the garage in search of perhaps … a late night snack. 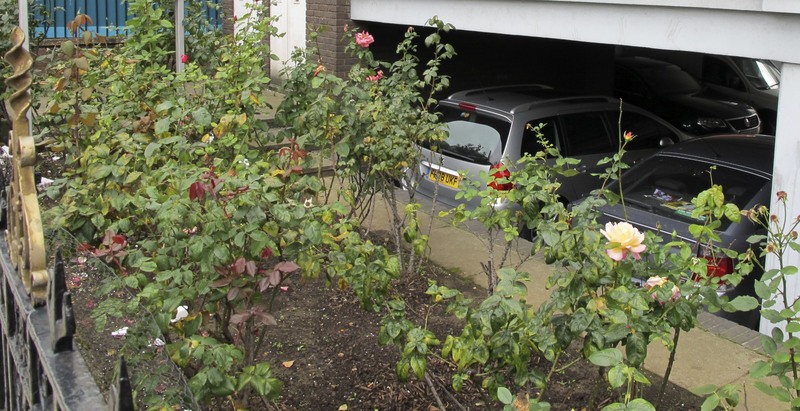 This photo taken the next morning shows the distance from the sidewalk to the car. While doing research for this post, I discovered an article citing a report released a few days ago that said in March of last year, 11 Penguins at the London Zoo had been killed by fox who had managed to get into their enclosure. Before the attack on the twin girls last June, I would not have thought much about the possible danger of having them around, but I was reminded by the articles I read that they are still wild animals even if some of them like the one we encountered do not seem wild at a glance. This entry was posted in Living in UK, Photography, Travel and tagged Elizabeth Harper, Fox Attack In London, Gifts Of The Journey, London, London Zoo, Urban Foxes In London. Bookmark the permalink. ← Public Displays Of Affection – When Is It Too Much? Elizabeth, Foxes have always been dangerous animals .. especially to other animals , and as you know now also to humans . 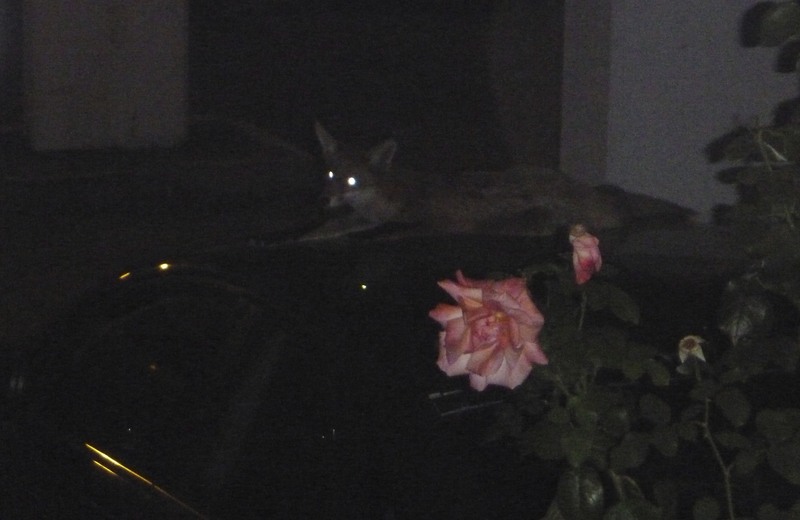 My mother-in-law has one that goes into her garden , I just hope that the fox does not attack her lovely cat. I am pleased that you were not attacked . 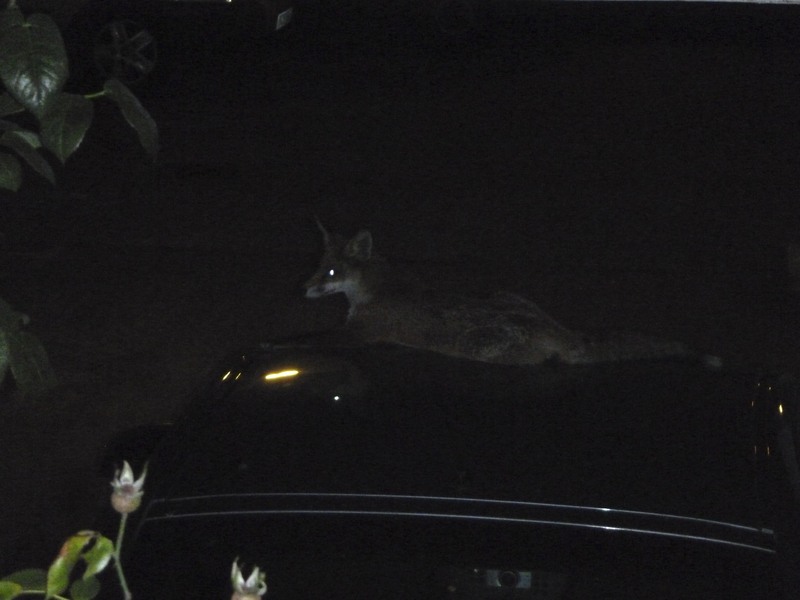 Even though I wouldn’t want a fox laying on my car or attacking people, I feel sad for that fox and all others that are deprived of their natural habitat. I’m sure he/she would rather be in some forest somewhere going after rabbits and other small wild animals. I would recommend to Anne that she tell her Mom to keep the cat inside. When we lived in Las Vegas, we had a block wall fence surrounding our house and behind our back yard, was desert and mountains. Our neighbors (who were very granola from CA) insisted on letting their cats roam. We told them about the coyotes we saw on a regular basis behind our homes. Neighbors said cats are quick, smart and can get on top of block wall fence. Few nights later, needless to say, I heard a ruckus out back, looked out the window and sure enough, the cat was smart enough to jump up on the fence, but it wasn’t tall enough that the coyotes couldn’t jump and swipe it off the same said fence. I felt sad and mad at our neighbors at the same time. We have to respect nature and realize that wild animals are only doing what comes natural in an unnatural environment. For the record, our neighbors learned their lesson and cats were always inside after that. A friend of mine saw a fox trotting along the side of the road with a dead cat in its mouth. Dinner! This was in Anchorage, Alaska, but fox (and coyotes) are moving in anywhere there’s food to be had. In some regions that’s because abandoned homes/factories become habitat for rats. Where there are rats, there will be fox. I just visited my dad in rural New Jersey (that is not a typo). During one of my daily walks I saw a dead fox (apparently hit by a car). When I mentioned it, my dad said that you can hear them barking at night sometimes. Coyotes are in the area too. When I was a kid no one ever saw either species. A contributing factor: The state introduced wild turkeys into the region a couple of decades ago, and now they’re as thick as fleas. Turkeys nest on the ground, and apparently coyotes will sneak in and steal eggs or poults. Glad you kept your distance, Elizabeth. ANY wild animal, (including those cute li’l squirrels) will defend itself. Nice photos but some of these comments are quite bizarre. 12,000 people hospitalised each year from dog attacks in the UK of which about 2000 are small children and yet the news and fear about foxes (based on 3 or 4 incidents over a 10 year period) just goes on and on. The reality is that these wild animals that live around us in towns and cities cause much less harm than our own pets. Cats for the most part could take a fox with little effort although in most cases they share the same space at night and just totally ignore each other. When you see a fox with a dead cat in its mouth, it was probably long dead (from a car or otherwise) before the fox dared go near it. Kittens would be more at risk with foxes just as fox cubs are at risk with adult cats. The hype over the story about the twins in London came mostly from right wing newspapers that support a repeal of the foxhunting ban (recently promised by the Tory government). They’ve been loving every minute of the press hysteria and using it to full advantage, sadly. I quite agree with mhayworth. Foxes are basically timid creatures and the increase in their numbers in urban areas is because food can be scavenged easily. It is just not true to say that their natural habitat is being destroyed and that is the reason for the increase in cities. Foxes are more common all over the UK than they were. Neither does the hunting ban have any relevance – most rural fox deaths are the result of being shot by farmers or hit by traffic. The truth is that sections of the press gorge on hype and ignore uncomfortable truths like the dangers of domestic pets and people being killed by other people in cars !